Ripple prices are stable but bullishSendFriend receives $1.7 million from Ripple and three other companiesTransactional volumes are unexpectedly low four days after Feb 8 expansionsDespite Cory Johnson exiting the company, XRP is stable as Ripple invests in SendFriend. 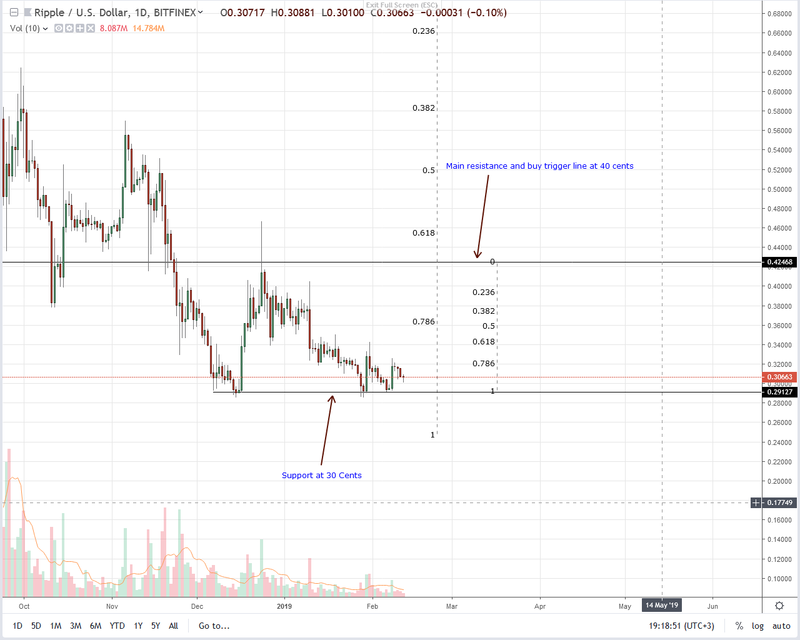 XRP prices stand to break above significant resistance levels. What we would like to see is first prices printing above 34 cents as bulls of Jan 30, and Feb 8 are confirmed.Ripple Price AnalysisFundamentalsLet’s crunch in some numbers. In 2016, the World Bank estimated that workers from all over the world would remit $575 billion. Out of this, remittance to developing countries would make up $429 billion.It is from these developing countries like the Philippines where SendFriend plans to open a payment corridor linking the country with the US. As impressive as it is, these statistics confirm previous findings from Mckinsey. In their 2015 report, they projected that by 2020, the global movement of funds would generate an approximate $400 billion as new payment rails improve efficiency and drastically slashing down costs.They go on and say that despite scrutiny of distributed ledger technology, analysts postulate that blockchain technology will be extraordinarily vital and shaping not only in banking but payments in particular. Their projections seem to be coming true. Trending news has it that SendFriend has received a $1.7 million in capital from Ripple and two other companies. Their objective is to reduce fees by a whopping 65 percent.Candlestick Arrangements Four days after expanding, XRP prices are stable. There is no discernible movement in the last few days. As visible from the charts, prices are oscillating within a tight trade range inside Feb 8 high low. Like in all our previous XRP/USD price analysis, we maintain a bullish outlook expecting confirmation of Feb 8 bulls.After all, buyers are in control in an effort versus result point of view. Besides, the double bar bull reversal pattern of Sep 2018 is now valid courtesy of bull bars of mid-Dec 2018, those of Jan 29-30 and on Feb 7-8. Any surge above 34 cents would trigger a bull run that would eventually propel XRP towards 60 cents.Technical IndicatorsIn the short-term, we retain a bullish outlook. However, for this position to be correct, prices must first print above 34 cents as aforementioned. That means XRP prices should rally and register possible double-digit gains. Backing this surge should be high volumes exceeding recent averages of around 15 million and even 42 million of Jan 30.